When a local cab driver doesn't know the way to the ground, one may be forgiven for wondering exactly what game of football one has signed up to. 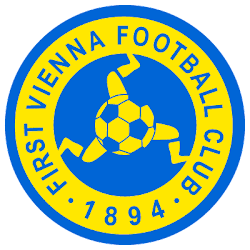 In search of some lower division fun during a short excursion through Austria's capital, myself and three friends turned up our reverse-snobbish noses at the relative giants of Rapid and Austria Vienna, opting instead for the oldest club in the land - the boastfully-named First Vienna FC 1894. "The famous football team" as their equally-boastful fans sang throughout the game, along with a host of other songs - nearly all bellowed out in English. This was one of the more honest chants, the final line corroborated by other songs being sung to the tunes of Gary Glitter and the Addams Family ("...Vienna family, da-da-da-da, *STAMP* *STAMP*, da-da-da-da..."). It made for great amusement, also allowing four lagered-up English monoglots to join in the fun. First Vienna's fans have to make their own amusement, you see. Lumbering at the bottom of the second division, it was immediately obvious that their side are as clueless as the cab driver who'd deliver us, via SatNav, to the wrong side of the ground (the side from where you can look down on the floodlit green, but can't actually get in). Playing an extremely conventional and rigid 4-4-2, First Vienna were under the cosh from a more fluid, technically adept and organised Lustenau side straight from kick off. The home side defended with two banks of four, and regularly relied on the solid performance of their 'keeper, Kuru Bartolomej (who should be good, given the amount of practice he inevitably gets). 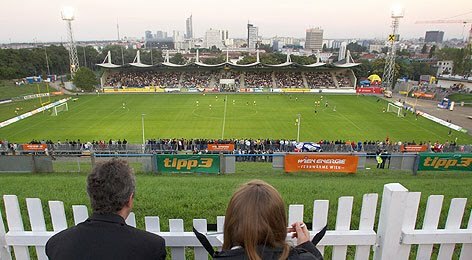 Somehow, however, First Vienna held on and the sides went in 0-0 at half time. We filtered out with the locals to stock up on more beer and emit the several pints consumed before the game. In the (men's) toilets there's a strange gallery of polemical stickers. One sticker depicts, from behind, three skin-heads in bomber jackets and Doc Martens taking a piss in a urinal, with something below about "die soziale national partei". I couldn't quite figure out if this was pro-Nazi or a, ahem, piss-take. Another sticker was for the "anarchosyndikalistische" lot, or "students" as we now call them in the UK. 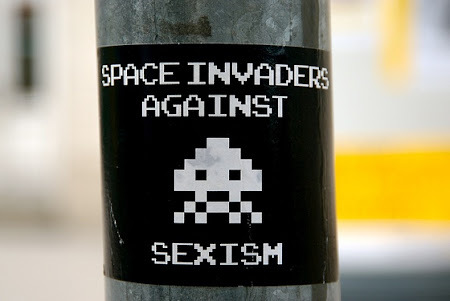 Another sticker boldly declared: "Space Invaders Against Sexism". Too right. In the second half Lustenau had the privilege of attacking the end nearest their 6 (six) travelling supporters. These half a dozen hardy lunatics spent the whole game isolated and drenched, standing and singing alone on the roofless stand opposite the home fans. I say "lunatics", but they use a slightly different word as a self-description, standing as they were behind a large banner reading "Freaks on Tour". Just two minutes after the break the freaks were jumping for joy as their team sprung the offside trap, and the notably impressive winger Daniel Schopf made it 0-1. The home fans were briefly silenced, but hardly surprised, and before long were singing and stamping away as before. One of First Vienna's many problems on the pitch is that they apparently have two "luxury" players upfront, yet have no ideas beyond hoofing it up to them as if they have the height of Duncan Fergusson and the work-rate of Carlos Tevez. They have neither, of course, so First were reduced to switching to a 4-3-3 with three attacking substitutions. It hardly brought the game to light, but it did get them a bit higher up the pitch, and their endeavour was rewarded with just a few minutes to go by a very generous-looking penalty decision. Up stepped one of their "luxury players", centre forward Rade Djokic, to send the 'keeper the wrong way and level the scores. As we jumped and punched the air and shouted "Vienna" it was hard not to be charmed by this club. Nick Hornby famously wrote how he fell in love with the Arsenal after a terribly scrappy 90 minutes of kick-and-rush at Highbury. The rubbish football was irrelevant; he wasn't after the faux-glamorous fare at Chelsea or Tottenham. He was after identity and belonging. You get both with First Vienna. All together now: "Yellow and blue are the colours, Football is the game..."
Pictures from the Official First Vienna FC 1894 website. You can follow both Julian Harris and European Football Weekends on Twitter. For more of Julian's work, make a beeline for his Gingers for Limpar blog. "I couldn't quite figure out if this was pro-Nazi or a, ahem, piss-take." the sticker is against nazis! many vienna supporters like döblinger kojoten for example (http://www.doeblingerkojoten.at/ ) are antifa`s. Vienna fans known as left wing to radical left supporters and known for their positive and political support. This sticker you mentoined, is an anti fashist sticker. It referse to the fpö (austrian freedom party, known for its links and open sympathy to the extrem right). This sticker mocks their election campaing posters up. But i guess its hard to understand if you are not local. btw: the adams family chant you are refering to is a left wing chant. Translated it goes something like this. Thanks a million for clearing that up chaps. You sound like the EFW team for us in Vienna! The vast but nonsinging majority of Vienna fans disapprove any political agitation in their football stadium, especially the left-clamor of the bolshevik "Kojoten" and other "oh-so-peaceful" left fan groups. These double-standard slobs insult and even beat themselves up just because some arrive in an "unofficial" bus to away matches whereby clan-foreign behavior is detected! The truth is, the district of Döbling - home and venue of the First Vienna FC 1894 - has a long anti-marxist tradition. we´ve got some idiots, too! the thruth ist austria has an anti-marxist tradition - not also döbling. but the vienna has an antifacist support tradition. so there are all kinds of left supporters in the stadium. anarchists,anarchosyndicalists,communists,trotzkis,rash skins and red and grenn democrats,...and of course there are also non-left supporters, but the are a minority in the so called "fan-block"
and always keep your tiraces tidy - first vienna football club! "Many thanks everyone for the fascinating comments, am really pleased that I submitted it to this site. I'm largely ignorant of First Vienna's history, but as someone equally opposed to fascism and Marxism, I'm a fan of "antis" of both. And a fan of football without politics, which is typically how things work best. Anyway, great stuff, will hopefully get back there for another game at some point." http://www.doeblingerkojoten.at/liedgut.php here u have most vienna-chants! yesterdays awaygame was not so good but the trip was fun!!! Rhineland derby with added Karlsruher.